It actually ranked better than some paid competition. We've all loved to hate Microsoft's free Windows Defender software—it's been so mediocre that it's been considered the baseline metric in third-party tests. But recent independent tests show it's actually outperforming a number of third-party suites, some of which charge you money to use them. 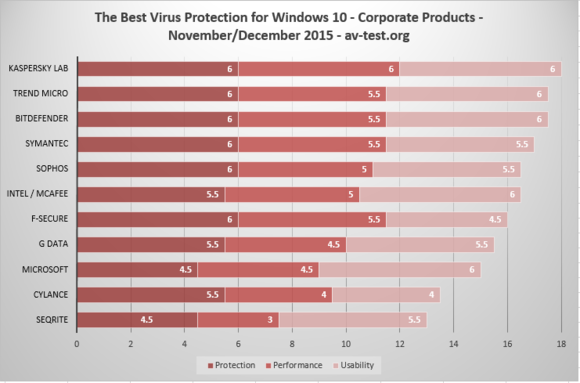 Results released by AV-test.org for the month of December put Microsoft right in the middle of the pack of its list of antivirus software for home users. Microsoft is still near the bottom of the heap in the business market, however, using the version of Microsoft System Center that’s been integrated into Windows 10’s business editions. Microsoft climbs to the middle of the pack in the December tests by AV-test.org. The results are telling. In Dec. 2013, AV-test.org tested how well 23 antivirus vendors blocked real-world malware samples using Windows 8.1. Microsoft finished dead last. In December 2015, again using Windows 8.1, Microsoft finished 11th out of 19, topping such names as F-Secure, ESET, Panda Software, and Comodo. Why this matters: If all you want is a free antimalware solution, most vendors offer you that option—making it relatively simple to switch to the most effective vendors. But not all: F-Secure, for example, charges you 30 pounds ($42.74) per device per year for its antivirus solution, with no free option. (The company does offer a free on-demand antivirus scanner via its Web site, which only detects existing malware on your system.) In other words, you could be paying for an antimalware solution which is underperforming the integrated antivirus already in your system. According to AV-test.org’s results, Microsoft does a very good job catching the most “widespread and prevalent” malware found during November and December, the timeframe of the study—99.6 percent for both months. But Microsoft’s Windows Defender caught only 97.5 percent of the so-called 0-day malware the testing firm threw at it in November, and only 90 percent in December. That’s actually not that great—most top-tier antivirus solutions, such as Avira, caught 99.9 to 100 percent of all the test malware, whether it be 0-day code or a well-known virus. (Avira, Bitdefender, and Kaspersky returned perfect scores.) Even F-Secure, which AV-test.org ranked below Microsoft, substantially outperformed it—catching 100 percent of the 0-day code and 99.8 to 99.9 percent of the prevalent malware. So why does Microsoft rank so highly? Because Windows Defender rarely bothers you. When Defender pops up a warning, you can be pretty sure that it has a valid concern. Solutions like Comodo and F-Secure falsely detected legitimate software as malware on several occasions, and falsely blocked legitimate software from performing certain actions. 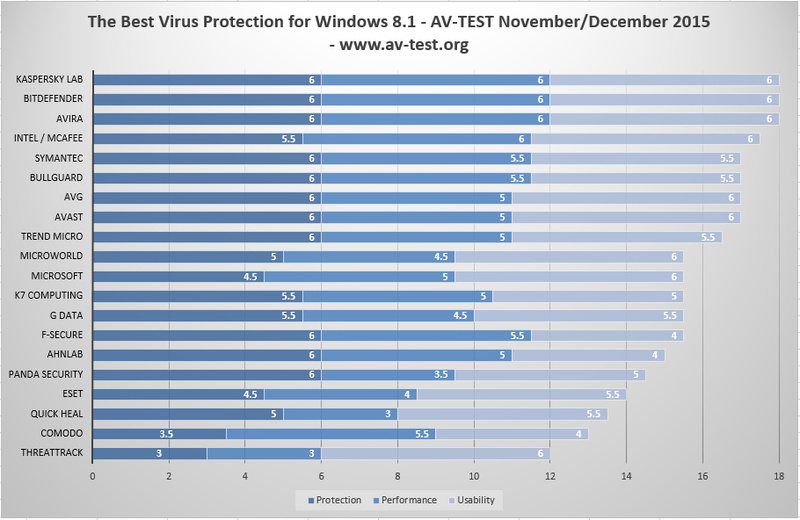 AV-test.org assigns points for performance and usability as well as protection; in the latter category, Microsoft still ranks in the bottom third. But the antimalware solutions that fell below Microsoft also tended to falsely report malware, and were penalized for it. AV-test.org also tested the Microsoft System Center solution built into the 64-bit business versions of Windows 10. Here, the answer is more clear-cut: choose a third-party solution. Only Cylance’s Protect and Seqrite’s Endpoint Security finished below Microsoft in the 11-vendor shootout, although only Seqrite arguably underperformed System Center in terms of overall protection. BitDefender Endpoint Security was virtually perfect, catching 100 percent of all malware and only falsely detecting legitimate software on one occasion. Microsoft still struggles in the business space, according to AV-test.org’s test in Dec. 2015. Microsoft’s Windows Defender isn’t great. In terms of protection, you can argue that it’s not even that good. Still, at least as far as its overall standing is concerned, it’s improving. We’d still recommend that you install a third-party antimalware solution. But, as they say, a rising tide lifts all boats. 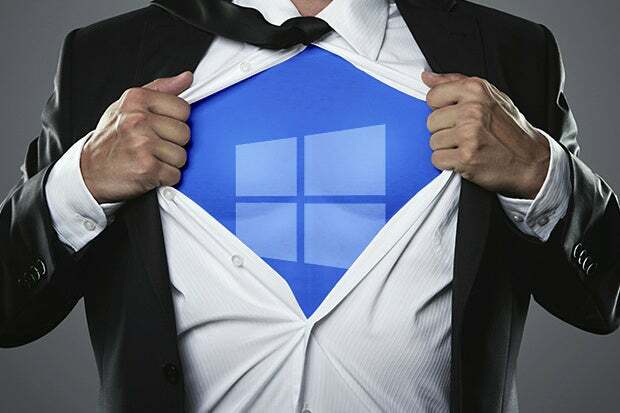 As Microsoft improves Windows Defender, so must the third-party antivirus software keep pace—or risk falling by the wayside. This story, "Microsoft’s Windows Defender antivirus is less awful than it used to be" was originally published by PCWorld.